Ice stamps are the latest phenomenon making an impression in Hotels, Bars and Cocktail Lounges around the world. 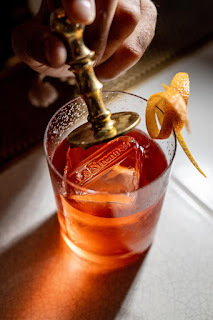 Featured in Modern Luxury Weddings Magazine, custom made ice stamps are an easy way for an establishment or an event to be even more memorable. An Ice Stamp is much like a Wax Seal Stamp, except for the fact that the art is engraved in reverse so that the engraving is debossed into the ice rather than embossed and raised as in wax. In addition, such a stamp needs to be engraved at twice the normal depth, in order to make a clear impression. Here's how you can add the ultimate personal touch to your drinks with a custom designed ice stamp. The clearer the ice, the better the outcome! Typically, freezing regular tap water will produce cloudy looking ice cubes. This will not show as clear as an impression. A Two inch square, thick, clear ice cube will produce the best result. Some Cocktail Lounges have special gadgets that will freeze the ice in a way that remove the air bubbles that cause the cloudiness. Alternately you can try boiling distilled water twice to produce decently clear ice at home. Begin by removing the ice from the freezer and let it sit for a few minutes. Keeping the ice out at room temperature ensures the ice won't crack when you press the stamp against its surface. Next, simply press the stamp firmly onto the surface of the ice and hold for 10 to 15 seconds. That's all it takes. You can serve the branded ice or store for later uses. If you plan to stamp more than one ice cube, we recommend you warm your stamp between each ice piece. The brass stamp will get cooler with each stamp you make. You can do this by soaking the stamp in warm water, using a heating tool or placing the stamp over a flame. Lasting Impressions. It's What We Do. At the end of the day, the design in the ice will only last as long as the ice doesn't melt but it's the smallest of details that make a difference in a presentation.